Are You Still Waiting Hours for a Fax? In a recent post, I described our highly successful meeting with stakeholders in the region’s transition to value-based care. To support the discussion during the meeting and provide materials that meeting participants could distribute afterwards, Hixny prepared a one-page hand-out focused on the data readily available to users of Hixny today. 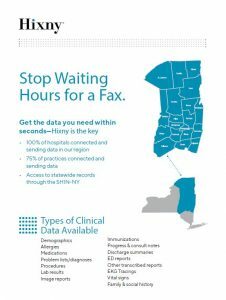 This handout, titled “Stop Waiting Hours For the Fax” was intended to remind users that Hixny has the data they need. Not only did we hear positive feedback about the handout and its simple messaging during the meeting, but attendees followed up with stories about what happened when they shared that handout in their own circles. One took the handout to a practice she works with regularly shortly after the meeting. “I handed it to the administrator at the front desk,” the attendee said. “She took one look at it and was so struck by the header that she told me, ‘This is going to help me—I want to read this …’” The front desk admin explained that she never reads handouts; she just puts them in a cubby where they’re never used. Hixny’s was the exception!